Here for your New Year's Eve entertainment is a new-old adventure story of "Carl & Jerry" titled, "Stereotaped New Year." 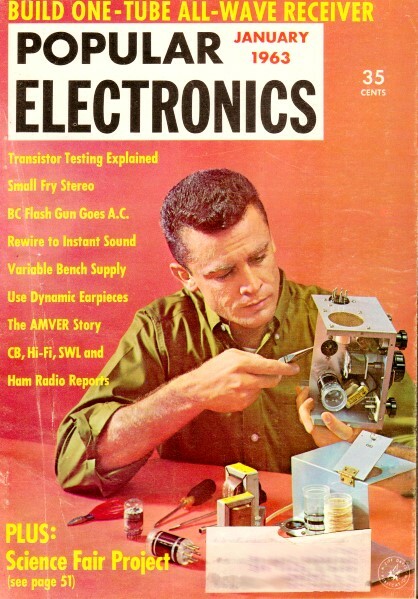 In the same manner that author John T. Frye's highly regarded "Mac's Radio Service Shop" technodramas had themes echoing the time of year they were published, this appeared in the January 1963 issue of Popular Electronics magazine, which would have arrived in subscribers' mailboxes in December. Carl & Jerry, if you are not familiar with the dynamic duo of the teenage electronics and Ham radio enthusiasts, routinely got themselves involved in police investigations, creature comfort inventions, and practical jokes involving tape recorders, disembodied spirits, and remote controlled models. By 1963, they were out of high school and matriculating at "Parvoo University," which many people believe is a reference to Purdue University, given the boys' Midwestern locale. Admittedly, this plot is not as exciting as most are, but what you have to know to appreciate it is that in the era tape recorders and stereophonic music systems were all the rage to those who considered themselves to be technically savvy. Electronics and mechanics magazines were filled with stories on them. It was early afternoon on the last day of the year. Carl and Jerry, home from college for the holidays, were lounging in the living room of their favorite young-woman neighbor, listening to the stereo tape recorder she had received for Christmas. "That's certainly a fine recorder, Norma," Jerry said when the prerecorded tape ended and she switched off the instrument. 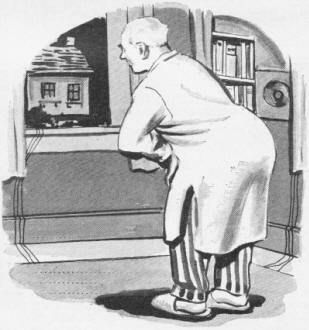 "Yep," Carl agreed, his words a little blurred by a mouthful of Norma's homemade fudge, "that stereo really makes everything sound alive and real and right here - say, there goes Mr. Gruber for his walk. Do Jerry and I imagine it, or has our old friend lost some of his zing lately? "I've always admired him for being such a non-typical old man," Carl went on, before Norma had a chance to answer. "None of that living-in-the-past stuff for him. Instead of reading the obituary and the 'fifty-years-ago' columns, he reads science-fiction; and he knows more about recent developments in space exploration than either of us. We both feel, though, that he isn't himself this vacation. He hasn't been picking our brains for things we've learned in the labs down at Parvoo, and he showed only faint interest in the university's new nuclear reactor. That just isn't Mr. Gruber." "I intended to talk to you about him," Norma said. "For one thing, he misses you fellows a lot when you're away at school. On top of that, the bad winter weather has kept him cooped up in the house. At any rate, there has been a change in his outlook. I didn't realize how much of a change until Mrs. Gruber told me yesterday that he isn't going to stay up tonight and welcome the new year in. He says New Year's Eve celebrations are for young people with a future ahead of them, not for old people who have only the past. You both know what an enthusiastic holiday-keeper he has always been up to now." "I'll say!" Jerry exclaimed. "It just won't be New Year's Eve if Mr. Gruber doesn't turn loose that old 10-gauge Baker shotgun of his at the stroke of midnight. He's been shooting it off ever since I can remember. This is serious. We've got to do something about it." "I'm not sure there's anything we can do," Norma replied. "Mrs. Gruber is plenty worried, and she has done her best to talk him out of this mood with absolutely no success." "It will take more than talk," Jerry said slowly and thoughtfully. "But I've got a kind of half-baked idea. You have any plans for tonight, Norma ?" "None I won't cancel to get in on one of those fiendish schemes you two dream up," she said promptly. "Some of the girls from the office are planning on taking in a midnight show, but you can count me in on anything you have in mind for Mr. Gruber." "Good! The first thing I want you to do is snag Mr. Gruber when he returns from his walk and hang on to him for at least an hour. Think you can do that?" "We'll be making a few changes in Mr. Gruber's room. Carl, you get those powerful little speakers from the stereo system in your room and bring them over to the Grubers' while I pave the way with Mrs. Gruber. Also get that roll of twisted-pair from the lab, and bring along an intercom speaker." He was putting on his coat while issuing these instructions, and soon both boys were gone, leaving Norma watching out her front window for the return of Mr. Gruber. Jerry quickly outlined his plan to Mrs. Gruber, and she agreed to it gladly without understanding a word of what he said. Carl came in the back door with a compact speaker cabinet under each arm, and the two boys went upstairs to Mr. Gruber's room. One of the matched speakers was placed behind some boxes on the floor of a clothes closet, the door of which was normally left open. The other was hidden behind the curtain of a bookcase sitting against the opposite wall. The intercom speaker/mike was placed beneath the bed. Leads from all three speakers were concealed beneath rugs and along baseboards until they fed out through the window and then across to Carl's bedroom window that was directly opposite it. Heavy gray clouds, carrying a promise of snow, had started rolling in from the southwest; and dusk came early. In fact, it was growing quite dark as the boys went out the back door and across the yards to the entrance of their basement laboratory. Just as they started down the steps, they saw Mr. Gruber come out of Norma's house and head for home. Norma came over to Carl's right after supper, bringing her new tape recorder with her. 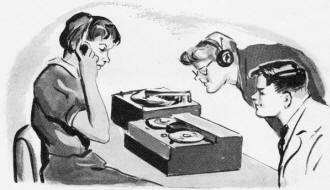 The boys had been busy rounding up some stereo sound-effect records from their friends, and soon the three of them were busily engaged in a recording session. The session was interrupted twice for mysterious missions. Once Jerry scurried over to his house and came back with a basketball in the hollow of his arm. Another time Norma went home and returned giggling and carrying her best pair of dress-up spike heels. Some of the sound effects were transcribed from the records onto the tape, using Carl's stereo pickup and his stereo preamplifier. Other sections of the tape were recorded "live," using both mikes. The latter required quite a bit of experimenting and redoing to get exactly the effect desired; so time slipped past quickly. It was just eleven o'clock when Carl and Jerry were finally satisfied with what they had on the tape, and it was then that the light came on in Mr. Gruber's window across the way. He was all ready for bed, attired in an old-fashioned nightshirt. After raising his window a bit, Mr. Gruber got into bed, took off his glasses and placed them on a table beside his pillow, and turned out the light. Through the sensitive intercom speaker/mike, the three young people in Carl's room could hear the old man's regular breathing. Carl plugged a pair of earphones into the intercom unit so that Norma could listen on one of them while he monitored with the other. Jerry started the tape recorder that was feeding the twin stereo amplifiers. The output of these amplifiers was now connected to the two matched speakers installed in Mr. Gruber's room. Through the earphones, Norma and Carl heard the plop-plop-plop of approaching hoofbeats. They grew louder and louder and then slowly faded out. That is the way it sounded over the earphones, but they knew that in Mr. Gruber's room the stereo effect from the two separated speakers would make it sound exactly as though a horse had walked through the wall of the clothes closet, had plodded across the floor into the bookcase, and then had gone on through the wall and away. The light snapped on in Mr. Gruber's bedroom, and they could see him fumbling for his glasses. He had barely put them on when an invisible player began bouncing a basketball on the floor in his clothes closet. Very deliberately this ghostly athlete dribbled the ball out across the floor of the bedroom to the bookcase, bounced it a few times there, and then turned around and dribbled it back into the clothes closet. Mr. Gruber's nodding head followed every movement of the invisible player. The ball had scarcely ceased whumping the floor when the distant lonely whistle of a locomotive came faintly into the bedroom. Rapidly the puffing of the steam exhaust and the clatter of iron wheels on the rails increased in volume until, with a roar and a Doppler-modulated shriek of the whistle, the unseen train drove straight out of the wall behind the bookcase, ran across the room into the clothes closet, and kept right on going. Involuntarily Mr. Gruber shrank back to let the train pass. As the clatter of the train died away in the distance, another interesting sound filled the room - a most intriguing sound to masculine ears. It was that of a young woman's high heels clicking along on a hard surface. She marched straight to the door of the clothes closet and then broke into a little run as she dashed over to the bookcase, where she stopped. Over in Carl's darkened room, Jerry stopped the tape recorder and switched in a live mike in front of Norma. "Come now, Mr. Gruber!" she said throatily. "What are you doing lying up here in bed when the New Year is waiting for you to welcome it?" Jerry cut Norma's mike and turned up another in front of Carl. "Come on downstairs and join the party," Carl's voice urged from the clothes closet. "It's almost New Year's Eve!" "All right, you young rascals; I'm sure you can hear me. Wait until I get some duds on and I'll be down. I might as well. I'd like to see the color of a man's hair who could sleep in this room tonight!" The three young people dashed across the back yards to the Grubers' back door, where Mrs. Gruber, laughing happily, let them in out of the snow that was just starting to come down. A few seconds later, Mr. Gruber, looking a little sheepish but still smiling good-naturedly, came down the stairs. Just as he reached the bottom of the stairway, Mr. Gruber glanced at the clock on the mantel and then made a quick dive into the front-hall closet. He emerged carrying a long-barreled shotgun, and all of them followed him out onto the front step. Pointing the muzzle up into the swirling snowflakes, Mr. Gruber pulled the trigger; and the 10-gauge Baker went off with a full-throated roar. "Happy New Year!" Mr. Gruber shouted as he grabbed his wife and kissed her soundly. They all stood out there in the snow, shaking hands and embracing each other while the whistles and the bells and the ragged popping of guns marked the end of one year and the beginning of another. The Grubers laughed heartily as Norma told how the boys had her mincing up and down past the mikes in her high heels while they made a recording .. Finally they filed back into the house where Mrs. Gruber had prepared a midnight lunch. "Martha," Mr. Gruber said in high good spirits, heading for the cellar stairs, "this occasion calls for a bottle of my wine." "Let's drink to this New Year and many more to come. Martha and I have seen lots of New Year's Eves, many pretty much the same; but there certainly is nothing stereotyped about this happy stereotaped one I thought was going to be so dismal. "You, my young friends, have taught me a lesson. Beginnings are for everyone, not just the young. Life is a mystery story, and who will say that turning a page near the back of such a book, where the mystery is being cleared away, is not as interesting as turning a page at the front? From here on in, that old 10-gauge Baker and I will be waiting eagerly to welcome each new year!" "Hear! Hear!" the young people chorused as they touched their glasses to his.